There’s the concrete jungle. There’s the urban cowboy. There’s all kinds of farm and animal metaphors that concern New York City, but none of them actually reflect the actual animals. The bull market on Wall Street has little to nothing to do with actual bulls, so any time you see a strange animal loose on the streets of New York or any major city, it’s kind of a big deal. For over an hour today, New Yorkers were transfixed by the story of the Jamaica Bull. 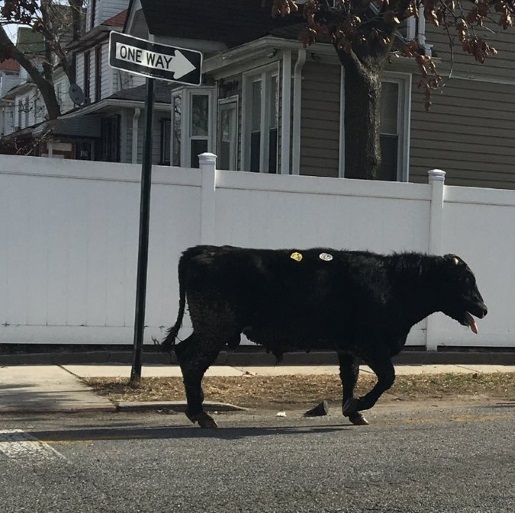 That’s right; a live bull was loose on the streets of Queens, rampaging through the Jamaica neighborhood. You’d think this is a one-time thing, some kind of fluke like a cow escaping from a trailer, but not quite. This is the third case of an escaped cow in New York City, courtesy of a slaughterhouse in Queens that must have some sort of hole in the fence. This particular bull is believed to have gotten out during a transfer of animals, using the noise of the cows moving around to slip through a gap in the pen and make a run for freedom. He’s known to be a particularly slick bull; he squeezed through cars several times to escape capture by authorities before tranquilizers and the exhaustion of his merry chase got the better of him. “From where you’re at to right here, I was face-to-face with the live bull, and then I shift to the left, he went to the right,” said startled Jamaica resident Jimmy King to CBS2 New York. Authorities have the bull in custody and have taken him to a safe place.